Are you feeding a crowd for a special occasion? Go big and bold with a Cajun seafood boil at Angry Crab Shack in Happy Valley. We serve tasty food, priced by the pound to feed groups of any size. Traditional Cajun seafood like shrimp, crab, and crawfish are fan favorites, but choices like lobster, clams, and vegetable tofu are deliciously made for order as well. Once you’ve picked your protein, sauce it up, spice it up, and choose your veggies. We’ll add them right to the bag, so you can go out the door with food that’s ready to cook. 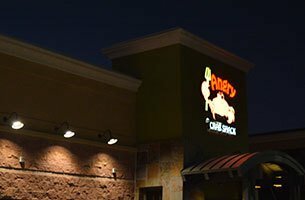 At Angry Crab Shack in Happy Valley, we provide an upbeat environment with satisfyingly delicious food. Whether you choose to dine in with us or take your exclusively seasoned meal to go, we offer a blend of tastes unlike any other.